Based on factors like gravity and speed, how you see time depends on where in the universe you're looking at it. A minute on the moon goes faster than a minute on the Earth. A minute on the sun goes slower. Time on the sun is actually stretched out so that if you could put a clock on the sun, it would tick more slowly. Click here for further details, attributed to a dear Jewish chap who helped my thinking on this one, no, not Einstein , Gerald Schroeder, a former nuclear physicist at MIT and a former member of the U.S. Atomic Energy Commission. Our solar system is located about two-thirds of the way out from the centre of the Milky Way. Illustration via Caltech. 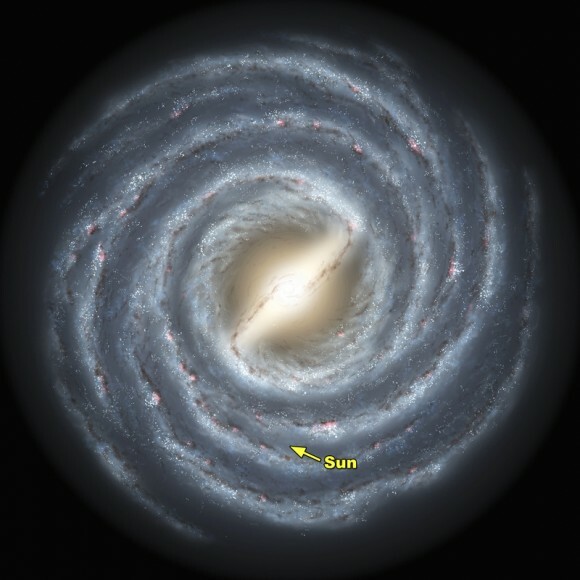 our solar system as it "partakes" of the general rotation of the Milky Way: 220 km per second. Mind you, it will take about 225-250 million "earth years" to complete a single orbit of the "galactic centre", we travel a most minuscule proportion every year. our stars in our solar neighborhood with an average speed coming towards or away from us: 20 km per second. our sun: with a radius of about 700,000 km and a circumference of about 4½ million km, rotation speed on its axis is about 2 km per second at its equator, taking about 27 days to make a full rotation. our moon: rotation speed on its axis is about 5 metres per second, taking a little over 27 days to make a full rotation as it travels about 2½ million km around the earth at an average speed of about 1 km per second. our earth itself: rotation speed on its axis is about ½ km per second at the equator. Speed as it travels 940 million km around the sun is about 30 km per second. Click here for a more detailed background. Why does the apple fall to the ground? Because it's attracted by gravity. Why is it attracted by gravity? It's because space-time folds around masses. - 7,750 million BC Time starts. 1,750 million BC Binds stickiness together forming seas, land appears and plant life. The earth is much hotter in this "pre-Cambrian" age, there is less oxygen, and there are perhaps a number of "ice ages" on the surface, with frozen oceans, and with glaciers "grinding" mountains to powder. At the close of the sixth day, about 4,000 BC, creates Adam to rule the earth. Sin (rebellion), violence, death, visits all creatures, ancient and young. a. God-Adam (father-father) revealing his favour and wrath focused on children of Adam at the start in Genesis chapter 2 until the flood and dispersion of these peoples worldwide, all knowing “about” God, if not knowing him directly, much deception abounding, e.g. as recorded in Job. reaching up to today three-thirds of the way, with the Gospel message now preached via pre-called and pre-chosen saints, through radio, TV, Internet-smartphones, in every language, literally billions, reading and hearing about the Lord and what he did, taking on our fallenness, on the cross. coming up to a seventh day (Christ’s return and millennial reign through the Holy Spirit, when Satan, the deceiver, is “locked up”). May 14th 2006 is the 400th anniversary of the proclaiming of our nation as belonging to the Holy Spirit: Australia del Espiritu Santo — as reported in English (and Spanish) by Purchas, vol.iv, p.1432, 1625. It is also Mother's Day. "But the mother of us all, Jerusalem on high is free" says the scripture in Galatians 4:26. While Eve is the mother of all living, heavenly Jerusalem (Sarah) represents the mother of all who live by grace i.e. God's unmerited favour. And May 14th-19th 2007 will be the 40th anniversary in the Jewish lunar calendar of the six day war to free Jerusalem. "For Hagar is Mount Sinai in Arabia and corresponds to Jerusalem as she is now, she slaves with her children" Galatians 4:25. One hotel in Jerusalem is currently promoting May 16th 2007 for bookings (that being the day Jerusalem actually came under Israeli control — though not Palestinian acceptance). And those words, six day war seem to me to be in themselves significant. According to calculations on the timeline page www.swcs.com.au/timeline.asp, it will then be the year 6,024 from Adam (with this year number commencing on Sep 23rd 2006). In the book of Revelation chapter 4, the number 24 is linked to 24 Elders who govern in heaven. It is a number related to God's government. It is also equal to 8*3. In the Scriptures, the number 8 refers both to Salvation and New Start — 8 people saved in the Ark — Christ raised early on the 8th day i.e. 1st day of the new week. In Hebrew & Western music, the 8th note in a diatonic scale is the 1st note in a new octave — being exactly twice the sound frequency of the 1st note in the lower octave. In the original Greek language, letters had individual values, and in the 6 letters of Jesus's name: I-H-S-O-U-S (pronounced in English as JESUS) 10+8+200+70+400+200 adds up to 888. We know Jesus is referred to as the 2nd man and is spiritually the 2nd person in the Godhead. And 2 coupled with 8 three times shows Christ's seal/stamp through 3 ages of God as the Trinity. So, we'll then have been 6000 years on our own, and had 31 years with the Son of God (the bridegroom) with us — 2 BC - 31 AD. If Christ was conceived by the Holy Spirit and born in the year we now call 2 BC, his 1st birthday would have occurred in 1 BC, his 2nd-31st birthdays in the years 1 AD - 30 AD, then in 31 AD crucified, risen Sunday (March 25th), ascended (May 3rd). So those years add up to 6031 both ways yes, it's a bit like double entry book keeping. Incidentally on this same day Ehud Olmert officially became 12th Prime Minister of Israel. The Jerusalem Post reported James Wolfensohn's resignation as special Mideast envoy. And an early subprime warning Merit Financial closed its doors. Click here for Newspaper Reports since May 14, 2007. With Jewish land possession, the 50th year, the first year following the seventh "group of seven", was always to be a Jubilee year when the trumpet would be especially blown (see Leviticus 25). It was a "Freedom" year for the agricultural land, and a year when every family's descendants would be allowed to reclaim their original title, based on land distributions set out (by lot) in the book of Joshua. Buildings (in a walled city) could be permanently sold, but wherever it was open land it always had to "go back". Interestingly according to Acts 13:20-21, David's ascent to the throne came in the 10th Jubilee year that followed 490 years (70 times seven) years of forgiveness from the Lord. And very interestingly in the timeline above, the six day war in June 1967, when Israel reclaimed all of Jerusalem, it came in the 70th Jubilee year that followed 3430 years (70 times seven times seven years) of forgiveness from the Lord. 1465BC to 1AD = 1465 years. 1AD to 1966AD = 1965 years. 1465+1965 = 3430 years (or 490 sabbaths). In the first instance, we see in 975-974 BC God's chosen king, David revealed. In the second instance, we see in 1966-1967 AD God's chosen city, Jerusalem revealed. Click here for a live webcam on the Western Wall. As a side note, it came 49 years after the freeing of Beersheba (and Jerusalem) from the Ottoman Empire, the 69th Jubilee year of 1917-1918, October-December 1917 to be precise. In the first instance, we see after 40 years in 935-934 BC, his precious son Solomon acknowledged in the nation. In the second instance, we see after 40 years in 2006-2007 AD, his precious people Israel acknowledged in the United Nations click here. In the first instance according to 2 Chronicles 3:2, we see in the 4th year of his reign in 932-931 BC, the commencement of the building of God's temple on earth, a holy place, a separated place, where at one point in its dedication by Solomon not even the priests could stand to minister 1 Kings 8:11. Built over a seven year period. Eden in 2010: In the second instance, did we see in March 2010 AD, the commencement of a huge split by the US Govt from Jerusalem on earth. From the viewpoint of a rebellious world, the start of a great divorce. Babylon crashing. Certainly the meeting in Copenhagen in Dec 2009 spoke of the fear, worldwide, of what people see coming upon the earth. In place of the inward peace of Christ, the outward confirmation — September 2006 — click here is in the news see Daniel 9:27. Then an intensely spiritual picture is seen, the Great Divorce between Heaven and Earth. Midway through seven years, the scriptures speak of seeing Eve in heaven, (now shining with the life-giving Spirit, Wisdom, Jerusalem our mother) bringing to birth a Man-child a corporate body of resurrected saints back to Abel, currently with Christ in the third heaven in Paradise. And as prophesied in Eden, the woman encounters Satan seeking to devour her seed. But her child is caught up to God and his throne, the Devil, forever "casting aspersions", is now "cast out" of Heaven, as Eve, on earth as well, flees into a wilderness place where she is nourished for 1,260 days Revelation 12:6. It is a time of trial on earth. But the "nourish" word reminds us of the promise in Revelation 3:10 to the "Philadelphia" church i.e. wherever the church "Loves the brotherhood", that "Because you have kept the word of my endurance, I also will keep you from the hour / season of testing intended upon all the world, to test those whose home is down on the earth". Click here for further thoughts on this church (and the other churches). "For the day of the LORD is at hand, and as a destruction (Heb. shod) from the Almighty (Heb. Shaddai) shall it come" Joel 1:15. Click here for 24 other Old Testament references. The time starts with a great earthquake, followed by the sun becoming black (sounding a little like a solar eclipse), the moon looking like blood, but then the stars drop, the sky, yes, the universe separates as when a writing scroll is wrapped together, and as everybody tries to hide, the Lord's face is revealed Revelation 6:12-16 see too Matthew 24:29-30. And also the time when Revelation 12:12 says "alas for those whose home is down on the earth and the sea, for the malicious accuser — the devil — has come down to you having great anger, knowing that little time he has left." "Where the body → the carcase is, there the eagles will be gathered together." Luke 17:37 and Matthew 24:28 quoting Job 39:30, see also 1 Cor 5:5. The physical city Jerusalem is assaulted — trampled into the dirt for 42 months see Revelation 11:2 and Zechariah 14:2. But as the Lord (1) pours out the spirit of grace-unmerited favour and supplications-earnest prayers on the House of David and on the inhabitants of Jerusalem (2) and as they look upon Him whom they have pierced and grieve bitterly (3) and as a fountain (of living waters) is opened for sin and impurity — God's focus will be on all of these to protect them, convert and refine them see Zechariah 12-14, Matthew 24 and Romans 11:25-26. Highlighted by Elijah's return see Malachi 4:5-6 "turning the heart of the fathers to the children — and vice-versa" culminating in the Return of the King, with his saints. So yes, if these dates reflect this coming situation, it is now very short. Come Lord Jesus.